GAMERA THE GIANT MONSTER: They Shoot Giant Turtles, Don’t They? – Schlockmania! After Godzilla proved there was money in showing giant prehistoric creatures destroying scale-model cities, enterprising Japanese filmmakers tried just about every giant building-stomping creature they could dream up. 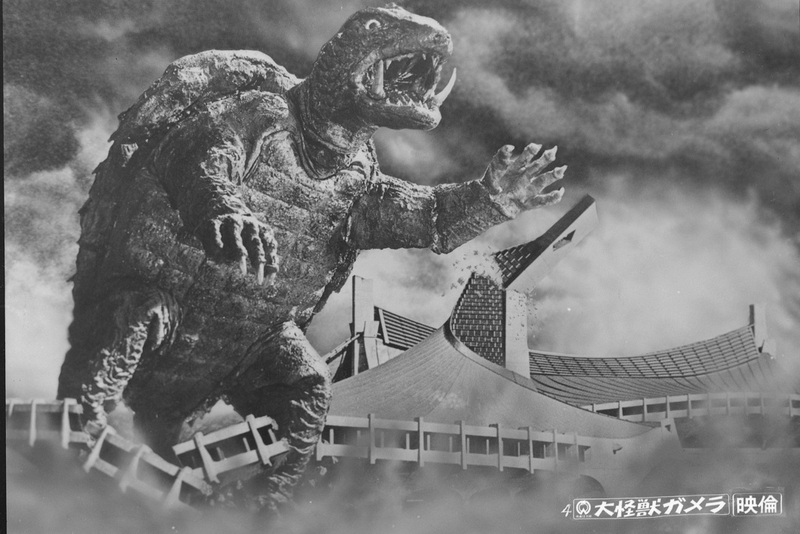 One of the most popular competitors for the Godzilla throne was Gamera, a giant monster turtle who ate fire and could transform himself into a scaly, jet-propelled flying saucer by retreating into his shell. He became one of the most popular characters in the kaiju-eiga (giant monster) field, inspiring countless sequels over the decades and finding a second life in North America via the lampooning he received on Mystery Science Theater 3000. Gamera The Giant Monster follows the template set down by the first Godzilla film pretty closely. The story begins with a skirmish between American air-force jets and jets from an unknown country that happened to be carrying nuclear devices. The mystery jets are shot down and the nuke-filled explosion awakens the title creature, a long-dormant guardian of Atlantis that has spent centuries frozen deep beneath the ice. Once awakened, he destroys a sea ship and disappears into the night. These events are witnessed by Dr. Eiji Hidaka (Eiji Funakoshi) , his assistant Kyoko (Harumi Kiritachi) and a scoop-happy reporter named Aoyagi (Junichiro Yamashita). Unfortunately for this trio, Gamera sets his sights on Japan and begins a pattern of attack on its cities. The solution to this problem falls to Dr. Hidaka, who teams up with Professor Murase (Jun Hamamura) to figure out a solution to the Gamera problem before Japan is destroyed. There’s also a subplot about a misfit, turtle-obsessed kid named Toshio (Yoshiro Uchida) who becomes a Gamera advocate after the beast stops in the middle of a rampage to save him from a certain death. 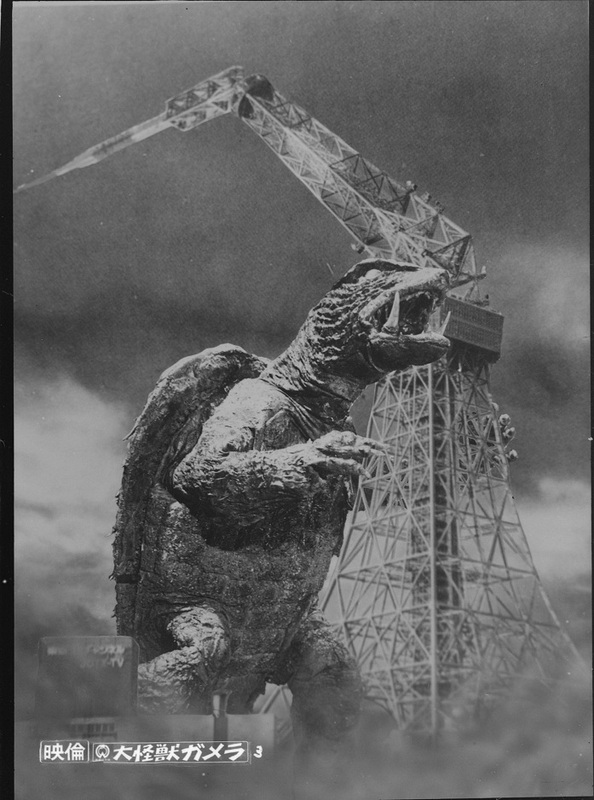 Overall, Gamera The Giant Monster is a prototypical example of the kaiju-eiga films that followed in Godzilla‘s wake. The plot follows an orderly “beast is awakened – beast attacks as a solution is sought – battle royale finale” progression. Funakoshi and Hamamura make solid, convincing “men of science” heroes. The characterizations and dialogue are all stock stuff with the exception of Toshio, who is annoying instead of heart-tugging. He’s an unfortunate nod to one of the lesser elements of later kaiju-eiga flicks: these films were marketed towards children more and more as the genre continued and the Toshio character is an obvious sop to the kiddie fanbase. That said, this is a plot-driven type of film above all else and Nisan Takahashi’s script delivers all the necessary monster-movie beats in a very tight, focused style. However, the real selling point here is the titular monster and his rampages. On that level, Gamera The Giant Monster delivers in spades. 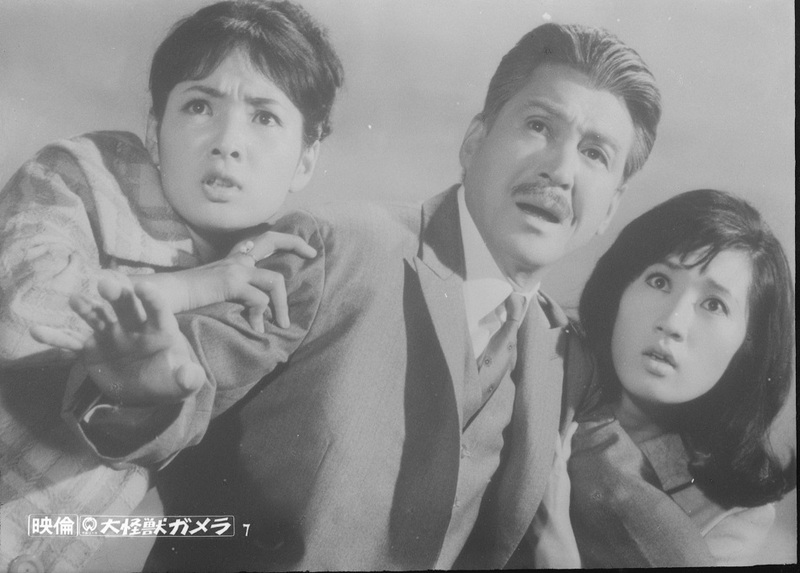 Nobuo Munekawa’s stylish black-and-white cinematography and Tadashi Yamauchi’s ominous score give the film a delightfully retro monster-movie atmosphere and director Noriaki Yuasa directs the action in a likeably straightforward style, avoiding camp humor and placing an accent on spectacle. The effects show their limitations by modern standards (obvious model planes, some visible strings) but Yuasa and his crew work hard to create a proper comic-book aesthetic to frame them. They are particularly successful during the awe-inspiring rampage sequences, where the black-and-white photography really enhances the grim spectacle. 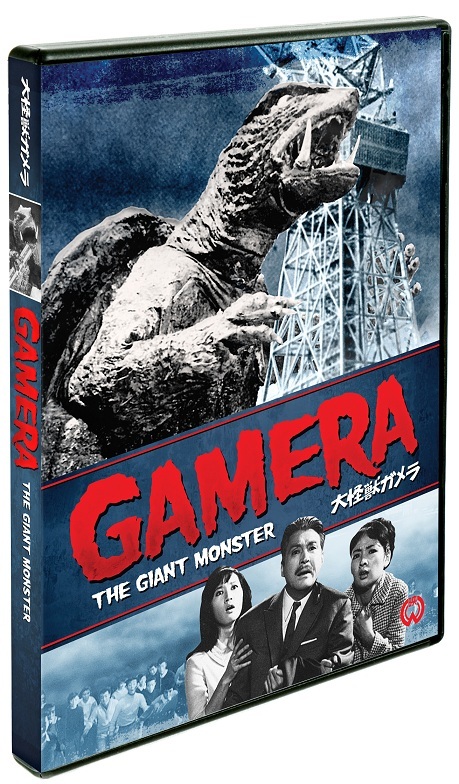 One last note of interest about this film: perhaps the most fascinating aspect of Gamera The Giant Monster is its positive portrayal of scientists. A lot of monster movies from this era portray scientists as amoral or foolishly idealistic but the scientists in this film are consistently noble and level-headed. They keep their cool in the middle of chaos, work towards a solution with tireless dedication (indeed, scientists from all over the world team up to battle Gamera) and take on the role of cool leadership usually occupied military leaders in films like this. This unique worldview adds an extra element of charm to the proceedings. To sum up, Gamera The Giant Monster overcomes its imitative approach through its focused, give-’em-what-they-want style. It’s the kind of fast-paced, unpretentious fare any fan of kaiju-eiga can have fun with and worth a look to anyone feeling nostalgic pangs for the genre.